Assos' SS.équipe_evo8 Jersey features their racingFit, designed for speedy cycling rather than more sedate rides to the coffee shop; so put those thoughts of a third macchiato to sleep. With its v-shaped, slightly lower collar, it has been designed for riding on the drops. However, if caffeine is called for, the sartorially-inclined cyclist can rest assured that this jersey’s black waist will keep you looking sharp and slim at the coffee bar. Brief stops only. Taking key technologies from their Campionissimo jersey, including notable design features such as the mesh back for increased breathability this jersey is all about performance. Moreover this jersey welcomes a wealth of new technologies including the 3D structure of the material to increase the surface area making it faster-drying, a more open structure for improved breathability, as well as bonded zip, waist and sleeve edges to render it more aerodynamic. Perfect when combined with a summer skinFoil base layer, this is the jersey to use with the Assos équipe short, giving you the perfect race outfit to meet the demands of the fastest riders. Designed for speed yet good looking enough for the coffee shop, the SS.équipeJersey_evo8 is all about performance without breaking the bank. Assos SS.équipe_evo8 Jersey is rated 4.0 out of 5 by 3. Rated 4 out of 5 by Gowiththeflow from Race Bred This is a very nice race top, with a slim fit and lightweight construction. The jersey is made with a mesh type fabric that, in my experience, does a great job of regulating temperature and wicking away sweat. 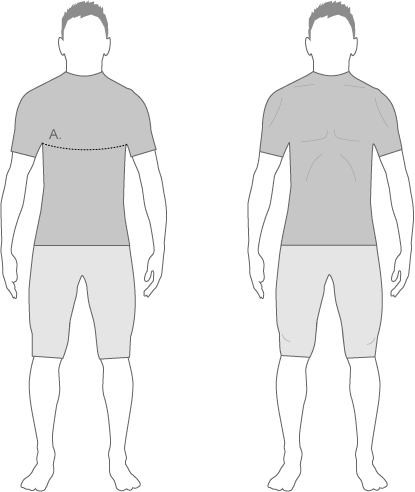 It's cut and shaped to be a very aero fit when you're on the bike but with the fabric having enough stretch to conform to the body. Do be aware it is tight fit - which is how I like it, but you may want to size up if you prefer a bit more space. Talking of size I took a small - and that was a squeeze on my skinny frame (180cm tall, 62kg, 94cm chest) - but not at all uncomfortable once you're out and riding. I've knocked a star off as i'd have liked to have seen a zipped pocket for valuables/keys - I can understand why it's not there as this is very much a lightweight 'race' jersey - but for us amateurs somewhere to stash keys safely when racing and training is very useful. Overall a stylish jersey, with an aero fit and lightweight construction that's great when pushing the pace, but just lacks a bit of storage space. Rated 4 out of 5 by MistaPreston from Race Fit If you want a super race fit lightweight jersey then this will fit the bill. Not a lot of room in the pockets unless you size up but a good a looking jersey for the summer. Rated 4 out of 5 by JDOC100 from Tight Tight Tight Quality Assos product (made in Lithuania! ), but Assos XLG ain't what it used to be. I have a 42.5" chest and 37" waist. According to Assos I need an XL, but I got an XLG (45.5") to be safe. There probably haven't been too many Tour de France winners with a 45.5" chest, so I don't understand why Assos have such small sizing. That said it is well made and finished and is recommended to very (very) slim cyclists, who should take the sizing chart with the proverbial 'pinch of salt'. According to the Assos website some of these Evo8 jerseys have a zipped security pocket on the middle back pocket, have yours or not? These do not have the zipped security pocket. This jersey has a UPF25 rating.